will be focusing on promotion of: faculty development in higher education, encouraging a culture of critical inquiry for promotion of evidence-based teaching and research,conductingoriginal research under supervision with ethical and moral values, publishing and presenting research work in national and international scientific forums and journals. The development of professionals by BUMDC MPhil program will thus play the role of a productive leader equipped with professional attitudes , ethical and moralvalues,theoretical, analytical, synthesis, application, implementation, self-critical, communication, social, team work and lifelong learning skills. BUMDC MPhil Programs OverviewThe objective of MPhil programs is to develop outstanding academicians and professionals for academic and healthcare world. The goal of Master level research program at BUMDC is to contribute to existing body of knowledge. This can be achieved when an MPhil candidate unveils new knowledge either by the discovery of new facts or by the formulation of theories or by the innovative reinterpretationof known data and established ideas. Our MPhil programs comprises of coursework and supervised research thesis in any one of the three disciplines – Anatomy, Pathology and Pharmacology. The programs are meant for graduates seeking to extend and deepen their knowledge by undertaking researchinvestigation under the supervision of faculty member of the departments of Anatomy, Pathology and Pharmacology. Our MPhil programs curriculum will enable candidates to master the concepts andskills of research directly relevant to health sciences in terms of care and management of problems. A successful MPhil graduate is someone who can bring ideas from his/her research findings, to bear on important health issues within the context of his/her individual workplace. The MPhil coursework components will be conducted by highly qualified faculty members of BUMDC. The coursework environment for candidates will be stimulating and challenging that requires substantial commitment of the candidate. The MPhil course work will introduce each student to a range of theories and methodologies used in health sciences research. 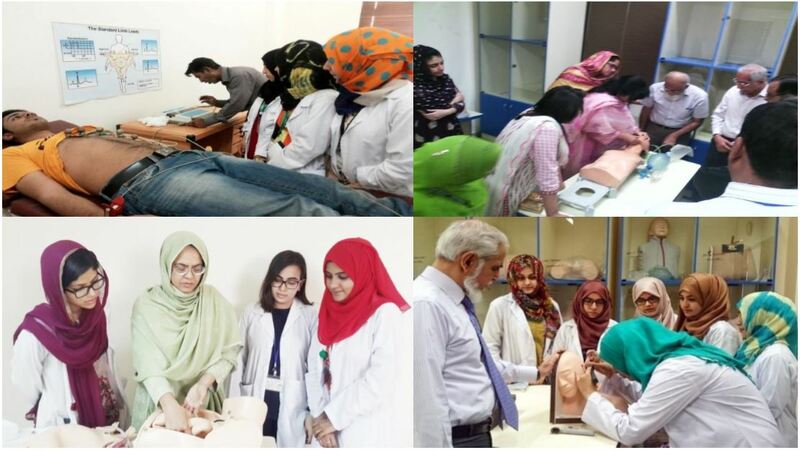 The coursework component of each MPhil program, Anatomy, Pathology and Pharmacology, consists of common six (6) core courses to be taken up by all students, stretching over the first semester. Four of these courses have credit hours while two, teaching internship and journal club are essential with no credit hours. These latter courses will continue till third semester. Each programhas five (5) subjectcourses with two (2) essential and (3) elective courses for the next two (2) semesters. The coursecontent will progress from broader aspects of research, to the specific skillsrequired to conduct and deliver a compelling research design and literature review relevant to the topic. Thestudent must thrive hard throughout thecourse work to enable progression towards the thesis. In accordance with HEC guidelines, thesis work is scheduled in the 2nd year of MPhilprograms. Thesis supervision will be conducted individually and student`s guidance will take place inthe form of supervisory meetings. The aim of the thesis is to demonstrate that the candidatehas made a distinctive and original contribution towards improvement of theories,professional practices and strategies in the field of health sciences. In each programa comprehensive thesis-style research project will beundertaken by a student on an individual basis. To facilitate the thesis process, each studentwill be allocated a principal supervisor, and co-supervisor(s) with expertise in the nominated discipline. The principal supervisor will be a permanent faculty member of the chosen program, who has undergone an appropriate researchexperience and has been approved for supervision by the PMDC and HEC. After the completion ofrequired coursework, student will defend the thesis proposal. If accepted, he/ she will work on the thesis in close consultation with his principal supervisor. Similarly, the completed theses upon approvedevaluation report will be presented for defense of thesis examination according to the university requirements. The minimum duration of MPhil program is two (2) years and maximum duration is four (4) years, in special circumstances and subject to approval by the Competent Authority. MPhil coursework of each program involves lectures,laboratory training sessions, journal club and teaching internship of five days per week. Duringlectures, students shallhave the opportunity to learn from the faculty member (s) and alsofrom their peers. Lectures will be highly interactive with content linked directly tothe real-world health issues as well as some philosophical underpinnings for knowledgeproduction. Laboratory training sessions, journal club and teaching internship will provide them skillexpertise and updated knowledge relevant to their chosen discipline which they can successfully use in their teaching internship.